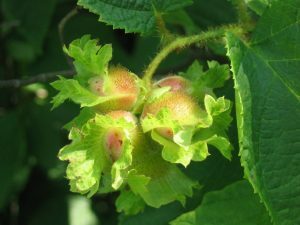 American Hazelnut is a multi-stemmed deciduous shrub typically found in open woods and woodland edges. Growing from 8 to 15 feet tall and wide, it is a carefree plant that fits well in a naturalistic garden. While American Hazelnut will grow in a wide range of conditions, it performs best in full sun to part sun. Frequently colonizing to form a small thicket, this shrub provides excellent nesting and cover for many songbirds. 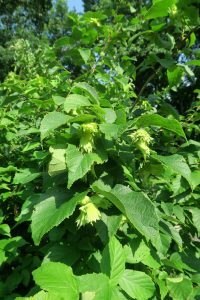 American Hazelnut is monoecious (both male and female flowers are on the same plant), and blooms in early spring. 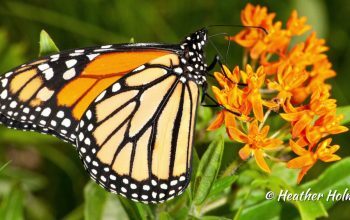 It is wind-pollinated, but some early-emerging bees may visit the plant for pollen. The edible nuts for which this plant is named, mature in the late summer or early fall. The sweet nuts can be eaten raw or roasted and are highly nutritious, more nutritious to wildlife than acorns or beechnuts. 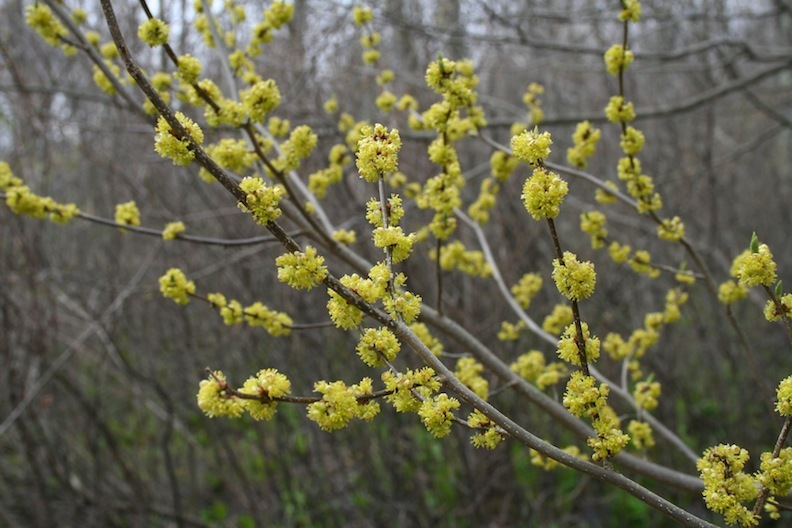 Spicebush is a welcome, and highly ecological replacement for Asian forsythia. A variable native shrub growing 5 to 12 feet tall, it will grow in full shade to full sun (given sufficient moisture). 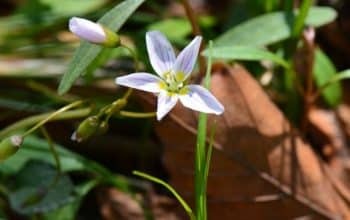 Its small yellow flowers appear in early spring, before the leaves emerge, feeding a variety of insects including small bees and pollinating flies. 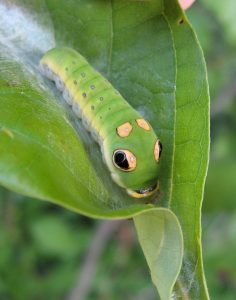 Once the leaves emerge in later spring, they feed several species of caterpillars including the Spicebush Swallowtail, the Eastern Tiger Swallowtail and the Promethea Moth. 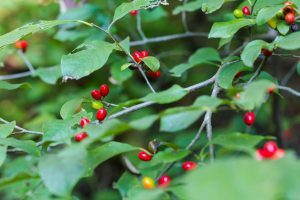 Spicebush is a dioecious shrub – plants are either male or female – and both sexes are needed for pollination and fruit production on female plants.Plant at least one male plant for every 3 to 5 female plants. In the fall, bright red fruit appears on the females, offering a highly nutritious meal to migrating birds before they travel south. Dry the fruit and grind it to add a spicy note to a cooked dish. 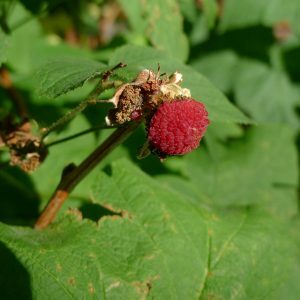 Considered the most ornamental of our native raspberries and blackberries, Purple-flowering Raspberry sports large maple-like leaves and fragrant, showy rosy-purple flowers that are attractive to honey bees and many native bees. Occurring naturally in moist shade or part shade, this shrub is a perfect addition to the woodland garden. Red or salmon-colored fruits follow the flowers in summer, and, although edible to humans, are most appreciated by wildlife. Plant two genetically different plants to get fruit. 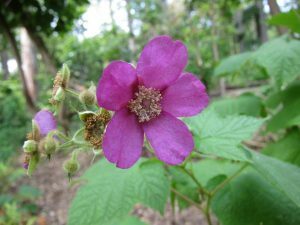 Purple-flowering Raspberry will form a dense, thornless thicket, highly valuable for shrub-nesting birds. Expect this low-maintenance shrub to reach a high of 3 to 6 feet, with twice the width. 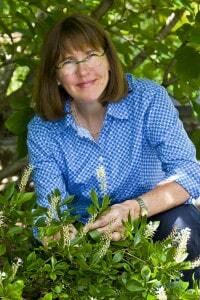 Remember – the best practice is to choose plants that are native to your region and appropriate to your site. 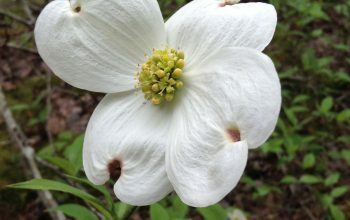 For more selections of great native shrubs, visit the native plant database of the Lady Bird Johnson Wildflower Center and do a search for the best plants for your landscape.